We went back to school for our latest Burning Through Brew City. Published Oct. 6, 2018 at 6:56 p.m. Burning Through Brew City this week is Burning Back to School, as our next spicy stop is familiar territory for yours truly: my alma mater, the place I somehow tricked into giving me a diploma, Marquette University. I have no complaints about my college days, in 2009-13, when I was a scrawny, patchy stubbled student scrambling to get articles written for the school newspaper – as opposed to the chubby, patchy stubbled "professional" scrambling to get articles written for OnMilwaukee that I am now. Actually, take that back, I had one major complaint, one that I whined about so often in the Marquette Tribune editorial office that it became a running joke amongst my friends on staff. There were too many sandwich restaurants on campus. During my school days, the campus was absolutely littered with sandwich shops: a Cousins, a Jimmy John's, a Subway. The best food deal in the AMU? A sub sandwich place, naturally, with the cafeteria's burger joint – just another kind of sandwich – right behind. We had a regular food truck visitor on campus ... a pita truck, which is basically just a sandwich. And if you believe a hot dog is a sandwich, there was The Dogg Haus to add to MU's surplus of stuff between sliced bread. I was far from a business major (Broadcast and Electronic Communications, which – fun fact! – doesn't exist as a major anymore) but even I could figure a noodle restaurant could make a killing on campus, filling an obvious gap. (Real Chili doesn't count, as you only eat there between the hours of midnight and 3 a.m. It's the law.) Was it really that hard to get a pasta place at Marquette? Apparently not – I just had to leave first. In 2015, two years after I graduated from Marquette University, the neighborhood finally got a noodle place: Tangled, found at 1404 W. Wells St. Opened by owner and chef Charlie Luo, Tangled originally offered an ambitious menu of brothy ramen bowls, noodle dishes and pretty much whatever you wanted – almost literally, as customers would receive a checklist upon entering, allowing diners to customize what kind of noodles, broth and toppings would go into the dish. However, a year and a half alter, Tangled revamped the menu, dropping the focus on customization and adding some more traditional Chinese-American rice dishes, trendy bubble teas and a popular lunch buffet option. The new twists worked, as the neon green chairs inside the restaurant are regularly filled with hungry students and culinary explorers. While there have been changes, Tangled has lost its love of authentic Chinese flavors. Many of Luo's dishes come from his experience growing up in China, with plates and flavors based from the country's various regions and provinces. 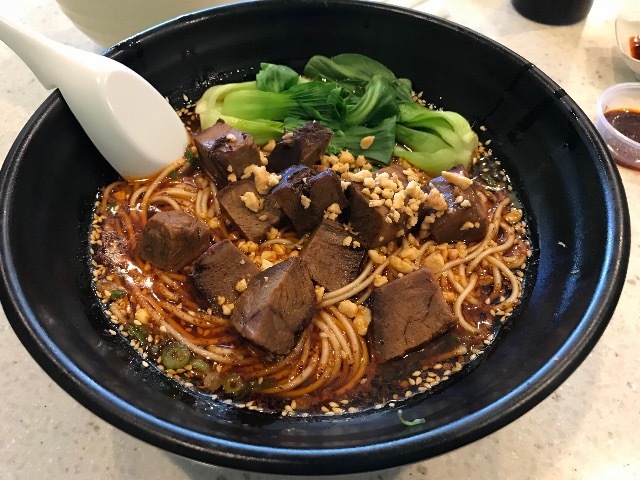 Take, for instance, the dish we tried during our visit: the Chong Qing Beef Noodle, a noodle bowl featuring brisket, bok choi, sesame seeds, crushed peanuts and a spicy broth made popular in the Chongqing municipality. We were told that, while every dish at Tangled can be made spicy depending on the customer's preference, this was the hottest dish at the restaurant, the one with the highest ceiling for heat thanks to the chili oil and Szechuan peppercorns. 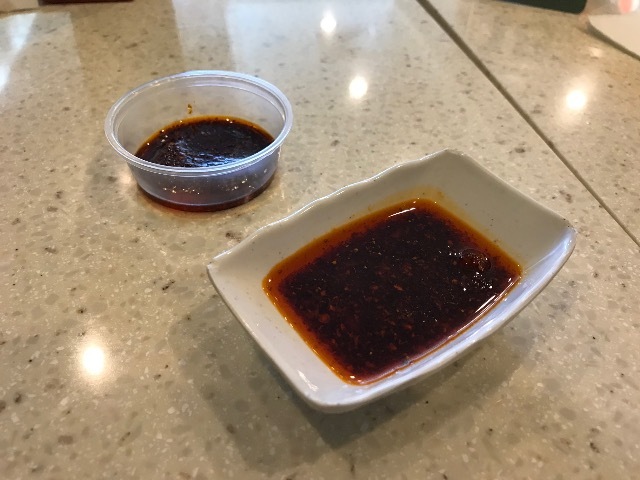 And in case it wasn't hot enough, the chef also brought out two little bonuses: a little extra tray of chili oil and a little dish of some mystery special chef's super-spice mix that he warned he typically didn't give out customers unless they were lunatics. Lucky for us, we are. So would Tangled land at the head of our class? Or would the Chong Qing Beef Noodle fail harder than I did in my Biology for Non-Science Majors class? Let's eat! Nick: Chili oil is my ketchup; I put it on everything. A meal based on it is just my style. Chong Qing Beef Noodle fits the bill, building up over a few minutes to a radiating heat you can feel up into your temples. A perfect level of satisfying heat for an early fall day. Matt: Whether you're a spice amateur or someone like Nick who apparently showers in chili oil on the daily, Tangled's Chong Qing Beef Noodle will find a way to mess you up. We ordered the dish at full-strength, which resulted in a strong, solid and relentless heat. But toss in the bonus chili oil AND the chef's secret monster mix, and you've got a bowl of major burn – maybe not the hottest temperature of food fire, thanks to the cooling presence of the Szechuan spice, but definitely one of the most consistently sweltering. It'll make you sweat even more than exam week. Matt: The stomach cauldron was in full effect after our bowl at Tangled, boiling away for several hours after our lunch. Everything tasted like that scrumptious chili oil for the rest of the day – and I was totally fine with that. Nick: The dish is pretty straightforward: broth, chili oil, noodles, baby bok choi, and brisket, with scallions and crushed peanuts on top. It's simple, spicy and totally works. The broth isn't as fatty as you might expect from a brisket bowl, but the chili oil helps to round out its weight. The noodles are a little plain, but thiner than average, which helps them soak up the broth between them so a bite of noodles isn't just noodles. The bok choi adds green freshness while the beef has a hearty flavor and a satisfying chew. Matt: Before our meal, Tangled's chef told us several times that he wanted to make sure our food wasn't just fiery, but still flavorful as well. Well, mission accomplished. The broth chili oil isn't just hot but kind of tinglingly cool as well thanks to the inclusion of some numbing Szechuan peppercorns. The noodles had that classic satisfying chew, while the brisket chunks were fatty (which probably helped cushion some of the spicy blow) and surprisingly tender. Even the chef's mega-spicy secret mix wasn't just napalm in a bowl, bringing a smoky afterburn to the wildfire. Nick: What's not to love? Tangled's Chong Qing Beef Noodle is a good noodle dish with genuine heat. I'd go back for it alone – but there are a few other intriguing menu options, so once again it looks like I have a new restaurant to add to the rotation. This one isn't *so* far from OnMilwaukee World Headquarters so the next time a good mind-clearing walk is on the docket, I'm heading to Tangled. Matt: This stop probably scores as one of our hotter stops – and definitely registers as one of my more frustrating ones. Frustrating not because the food wasn't delicious; our Chong Qing Beef Noodle bowl was everything we hoped it would be, spicy and satisfying, and the rest of Tangled's menu appears to have plenty of similarly scrummy authentic Chinese dishes. No, it's frustrating because WHY DIDN'T THIS PLACE EXIST WHEN I WENT TO MARQUETTE!? Instead, we had 47 sandwich places. The rest of my student loans should be cancelled due to this obvious injustice. Anyways, everyone – whether you're searching for spice or just a tasty lunch – should work on making their way to this hidden gem. And I'm going to work on a time machine so I can go back to college and bring Tangled back with me.